Sainsbury's supermarket in Andover has invested in a CopriSystems' loading bay canopy to protect goods and operatives during the unloading process. Side wall mounted against the building, the canopy is 10m long, 6m wide and 5m high. It protects a scissor lift method of unloading and helps reduce wind, rain and dust issues. 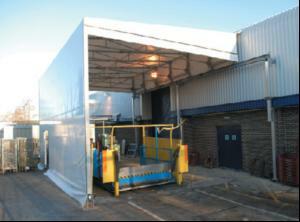 The canopy is suitable for a 'drive through' unloading process as each end of the tunnel can be left open. If the ends are shut, an effective airlock can be created when the warehouse doors are opened. Made from galvanised steel frames and with a PVC-coated polyester fabric cover, the canopy did not need ground works and was installed in a matter of days.